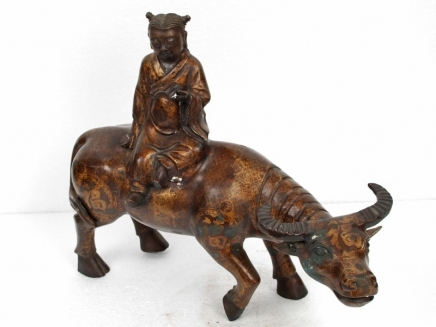 You are viewing a wonderful sculpture of a Chinese scholar of Confucianism sitting on the back of a water buffalow. The piece is cast from brown bronze and is Tang in style due to the intricate patterns etched and painted in gold on the surface of the brown bronze depicting at times Chinese symbols and patterns, some almost Celtic in style and design. These are hand painted so you can imagine the level of craftmanship that has gone into this particular piece, not to say the time taken. It’s a wonderful study and depicts the serene looking scholar with his book open as this faithful water buffalo leads him around. He is believed to be a scholar of Confucianism due to the fact he is travelling and would be spreading the word of Confucius. This would make a unique decorative item for your home and its a wonderful study. The bronze is hollow cast so not too heavy and it has a lovely patina to it. Historiography was an interest of Chinese scholars from very early times, and it was invested with the task of conveying applicable lessons for human life. The lessons of history were an integral part of all Chinese learning, an attitude strongly emphasized by Confucius, who stressed the importance of exemplary history and the keeping of authentic records. The Shujing (Book of History), containing documents from the early and middle Zhou dynasty (c. 1122-256 bc), and the Chunqiu (Spring and Autumn Annals), chronicling the history of Confucius’s home state of Lu between 722 and 481 bc, were two of the Five Classics of Confucianism. The Tang dynasty saw a tremendous cultural flowering. Tang institutions and culture were adopted and imitated in Korea and Japan, while Tang culture benefited from the cosmopolitan influences of the far-flung empire. Chinese Buddhism reached its highpoint under the early Tang, with the celebrated pilgrim Xuanzang bringing back Buddhist sutras from India in the mid-7th century; Islam, Manichaeism, and even Judaism were also represented in Tang China. Tang Buddhist missionaries were immensely important to the spread of the religion in Japan and Korea. Related to the African water buffalo, yak, American bison, European bison, and four-horned antelope, the Asian water buffalo, Bubalus bubalis, has been domesticated and is now found throughout India, Asia, South America, Europe, and southern Africa.